Laurent-Perrier and Chatsworth came together to create a breath-taking garden that was awarded the prestigious Gold Best Show Garden Award at the Royal Chelsea Flower Show. The design showcased a wild and natural approach to garden design. The Garden serves as an inspiration to us all; elements of the design can be used in any size of garden. Get the look with our Range of New and Reclaimed Railway Sleepers. 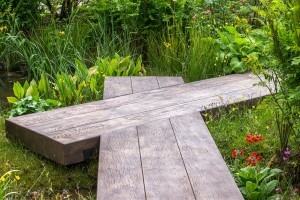 Pay tribute to The Royal Chelsea Flower Shows Best Show Garden and enjoy your Outdoor Space.